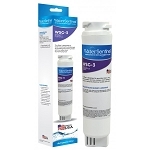 The Water Sentinel WSW-2 Filter Cartridge is a compatible used for Whirlpool EDR5RXD1, 4396510 and 4396508, KitchenAid, and Sears/Kenmore side-by-side refrigerators with turn access through the front base grille. 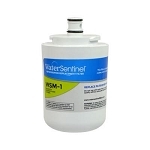 It does a great job of reducing chlorine taste and odor, particulates, lead, mercury and more. It also retains beneficial fluoride. Make sure to replace your filter every 6 months. Turn filter one-quarter turn counter-clockwise. Save grille cap. Place grille cap on the new filter. Insert filter turn clockwise until firmly seated. 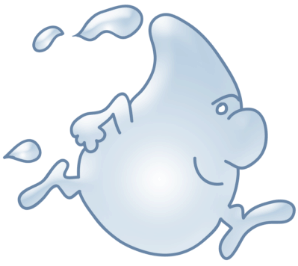 Flush filter: 2 quarts of water through the filter and remove air. Flow will sputter until the filter is full. Q: have HF-150 cartridges and wonder if these would work? S-1A also on package. A: My understanding is that the WSW-1 is being discontinued. On some sites they're not available at all; only the WSW-2. I had been ordering the WSW-1 in the past, but purchased the -2 this time. Received and installed it in my Whirlpool fridge about a week ago. No difference in size, installation, or function. Q: What is the difference between WSW-1 and WSW-2? A: Shipping is $5.00 Flat Rate Shipping for orders under $99.00 and Free Shipping for orders $99.00 and over if shipping within the 48 Contiguous United States. A: Because it is the correct filter according to the model number, unlike the one you sent me on 9/20/12. Q: free shipping to CA If i buy 2 filters????? Q: 469010 part# is in ny side by side now but has a black turn handle.Do you have this item in a black turn handle? A: The black turn handle is a cover that slides over the white plastic.